Hearthmind asks a simple question: what if the ambient bustle on Hearthstone’s soundtrack weren’t the sound of watching pub-goers, but a horde of would-be players all jostling for a seat at the board? The answer is less simple, however we do have an answer to if you should play in our Hearthstone review. It’s yes, yes you should. Crowdsourced tactics. Doesn’t bode well, does it? 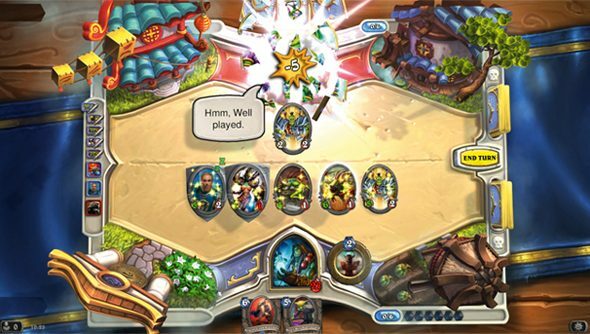 Hearthstone demands precision, thoughtfulness, and an overarching strategy. Twitch Plays Pokemon was the antithesis of these things – but some enterprising CCG players have gone ahead and adopted its model regardless. Over on the Hearthmind site, a stream runs and runs. A chat bar dominates the right-hand side of the screen, just as it did in TPP. Viewers can click and hold anywhere on the board to draw arrows – optimistic advice that stays visible for a couple of seconds. A five second timer appears to calculate which instruction to implement. As with the chat, however, an arrow soon disappears from view – another voice muffled beneath the masses. Asked whether the Hearthminders had won a game yet, one dedicated commenter replied: “We nearly did, but fireballs to the face etc”. Picking the mage class has apparently resulted in one too many own goals, so to speak. Do you think you’ll get involved? All here at PCGN found crowdsourced Pokemon a strangely lonely experience.